Danger Islands, off Antarctica. Landsat-8 image acquired on 7th December 2017. Image courtesy of NASA/USGS. World Wildlife Day is the 3rd March, and so fittingly this blog is looking at how satellite imagery and remote sensing techniques were used to recently discover an unknown colony of 1.5 million Adélie penguins on the Danger Islands off the Antarctica Peninsula in the north-western Weddell Sea. Adélie penguins only live along the Antarctic coast, and they grow to a height of around 70cm and weigh between three and six kilograms. The paper by ‘Multi-modal survey of Adélie penguin mega-colonies reveals the Danger Islands as a seabird hotspot’ by Borowicz et al was published in Scientific Reports on the 2nd March 2018. It is interestingly not only because of the discovery of unknown penguins but also because the research combines historic aerial imagery, satellite imagery, drone footage and remote sensing techniques. The research has its roots in an earlier paper by Lynch and Schwaller from 2014, entitled ‘Mapping the Abundance and Distribution of Adélie Penguins Using Landsat-7: First Steps towards an Integrated Multi-Sensor Pipeline for Tracking Populations at the Continental Scale.’ It describes the development of an algorithm to analyse Landsat and high resolution imagery from WorldView-2 to estimate the size of penguin colonies based on the extent of the guana area. A classification approach was developed from a training dataset of 473 Landsat-7 pixels covering existing Adeline colonies, supported by over 10,000 pixels relating to features such as rock, soil and vegetation. High Resolution Imagery: Areas of guano staining on the Danger Islands were identified manually from WorldView-2 scenes. Historical aerial photographs: Images taken by Falkland Islands Dependencies Aerial Survey Expedition (FIDASE) on the 31st January 1957 were digitally scanned and geo-referenced to the WorldView-2 data. They were then divided into polygons and analysed using manual classification processing using the open source QGIS software. Landsat: The algorithm previously developed by Lynch and Schwaller was enhanced to work with data from Landsat-4, 7 and 8 by calculating the mean difference of similar bands from Landsat-4 and 8 compared to Landsat-7, and then adjusting based on the mean differences in each spectral band. The enhanced algorithm was then used to classify the penguin colony areas. 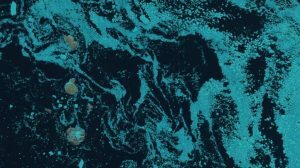 Drone data: Using a 1.2 megapixel camera flown at height of between 25 m and 45 m, captured footage was processed to produce georeferenced orthomosaics of the Danger Islands. Machine learning techniques were then applied using a deep neural network to locate and identify potential penguins. A training dataset of 160 images with 1237 penguins, followed by a validation dataset of 93 images with 673 penguins was used to teach the network. Once fully trained it analysed all the islands, and the results were validated with a number of manual counts. The scientists worked on an accuracy of plus or minus ten percent for the automated counts, although the variation with the in-situ counts was only 0.6 percent. The outcome of this research was an identification of 751,527 pairs of previously unknown Adélie penguins on the Danger Islands. More surprisingly is that this increases the world estimates of this type of penguin by almost 50%, when it had been thought that the population had been declining for the last 40 years. The historical aerial imagery has led scientists to speculate that this new colony has remained constant for around the last 60 years in contrast to other known colonies. This work is a great example of not only how much can be achieved with free-to-access imagery, but also how satellite imagery is helping us discover new things about our planet. This entry was posted in Data, Earth Observation, Education, Landsat, NASA, Oceans, Remote Sensing, Satellite, Space Can Help, Space Industry and tagged Adélie penguins, aerial imagery, Antarctica, Borowicz et al, Danger Islands, drone footage, Falkland Islands Dependencies Aerial Survey Expedition, georeferenced, Landsat, Lunch and Schwaller, Machine Learning, manual classification, penguins, QGIS, satellite, satellite imagery, Space, Wedell Sea, World Wildlife Day, WorldView by Andy. Bookmark the permalink.